AiroPeek NX Expert WLAN analyser v2.0. 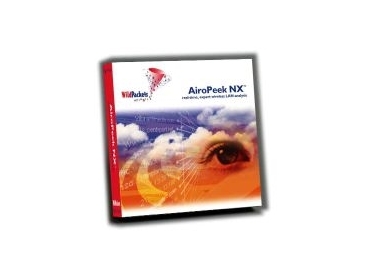 VICOM has released the AiroPeek NX Expert WLAN analyser (v2.0) from WildPackets. The AiroPeek NX, expert wireless LAN analyser, is the only wireless management tool needed to deploy, secure, and troubleshoot wireless LAN. AiroPeek NX covers the full spectrum of wireless LAN management, including site surveys, security assessments, client troubleshooting, WLAN monitoring, remote WLAN analysis and application layer protocol analysis. AiroPeek NX allows IT professionals to manage every segment of their extended enterprise network. AiroPeek NX features include: 802.11-specific expert diagnostics, site survey and security audit features and a channel signal strength meter with graphing and alarm setting capabilities. The unit also offers good VoIP analysis and on-the-fly and post-capture WEP decryption. This new release adds multi-mode a/b/g and Wi-Fi Protected Access (WPA) support, good security audit features and RFGrabber distributed WLAN analysis. In the areas of configuration, connectivity, intrusion detection, rogue access, denial of service and man-in-the-middle attacks, 23 expert diagnoses have been added. The SSID Tree window tracks dozens of characteristics and throughput statistics and enables easy spotting of rogue clients and access points. Rich graphing capability enables multiple data points to be tracked simultaneously. New decoders and the ability to comprehensively decode protocols, even when tunnelled, have been added since earlier versions. AiroPeek NX v2.0 provides support for the largest array of 802.11a, b and g adapters of any wireless analyser. These include Cisco Systems AIR-CB20A Wireless LAN PC Card, D-Link AirPlus Xtreme G DWL-G650 and DWL-G520 Adapters, NetGear, Linksys, and others.